Brian Massey has helped hundreds of businesses build sites that drive sales. In Your Customer Creation Equation, he shows you how to put aside your preconceived notions and replace them with proven recipes for online success. Get everyone on your team aligned to produce outstanding results—at all times. The decisions you’ve made around your website make sense, but do they make cents? 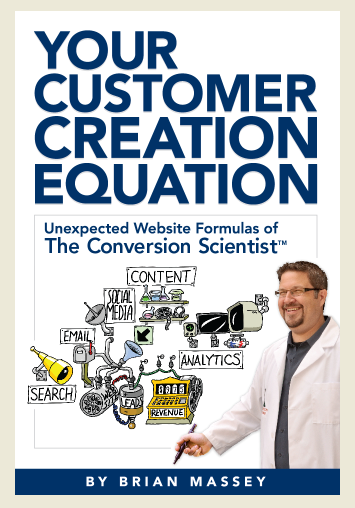 Your Customer Creation Equation will uncover your unique website formula, equipping you with the strategies and data collection tools you need to generate leads and sales online. If you are managing the construction or redesign of a business website, or you just want better results from your site, this is the book for you. Brian Massey is The Conversion Scientist™ at Conversion Sciences and he has the lab coat to prove it. His rare combination of interests, experience, and neuroses was developed over almost 20 years as a computer programmer, entrepreneur, corporate marketer, national speaker, and writer. “Conversion” is the process of converting web traffic to leads and sales, and Conversion Sciences brings this ability to businesses of all sizes. Brian’s mission is to change the Internet from a giant digital brochure stand to a place where problems are solved and dreams are fulfilled. He’s helped dozens of businesses transform their sites through a steady diet of visitor profiling, purposeful content, analytics, and testing. 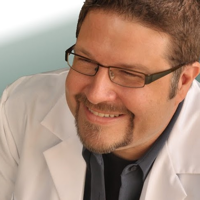 From his digital conversion lab, he transmits via The Conversion Scientist website and through his columns at ClickZ.com, Search Engine Lane (SearchEngineLand.com), and the Content Marketing Institute (ContentInstitute.com). Brian aims to “get students early” by speaking at major universities and is available for corporate workshops. Brian lives and works in Austin, Texas, where life and the Internet are hopelessly entwined. Check out this episode of Content Marketing 360 Radio Show, host Pamela Muldoon talks with Brain Massey about his book! There are places on the Web that are instantly familiar, that make you feel that they were built with your needs in mind. Is your website one of those? It could be. Conversion Sciences is a team of geeks and creatives that are actively working on sites like yours to make them the kind of place that visitors feel confident taking action — sites that grow businesses. No matter how sophisticated you may be now, we have a place for you to plug into the conversion journey. Just starting out? Continue your study of conversion practices at www.CustomerCreationEquation.com. Building your own digital conversion laboratory? Start at www.DigitalConversionLab.com. If you have the tools, we can provide some nice people in clean white coats to put those tools to work for you. Our services are detailed at www.ConversionSciences.com. Ring up more revenue from the visitors to your site. Slash the cost of getting advertising and marketing. Entice return visits from prospects and customers alike. Choreograph your advertising, social media, email and search with your site so they work together. If you’re not familiar with us, get started by subscribing to The Conversion Scientist, our free weekly guide to smart websites. Or get a jump on adding some science to your site, and contact us right now. We’re waiting to hear from you. Other ways to connect with Brian: Google+ & Pinterest. You can also check Brian out on Goodreads!